What’s up with all the penguin stencils around Ocean Beach? 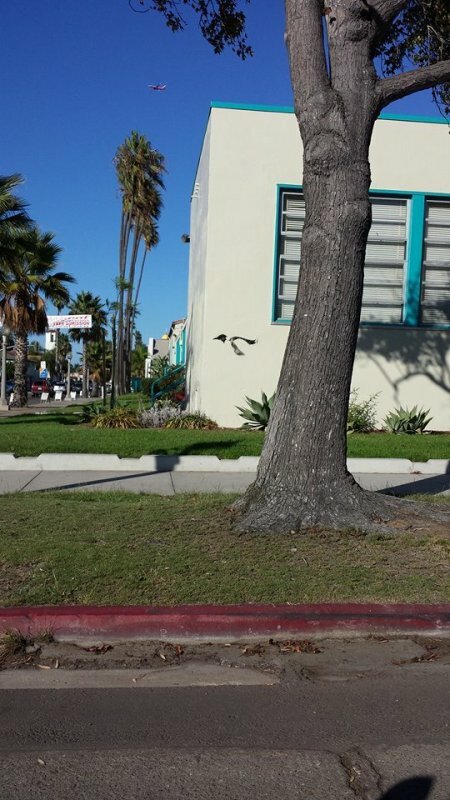 Hey, what’s up with all the penguin stencils (some call it “graffiti”) around OB? What the heck is going on? Someone is using a penguin stencil to paint a penguin with a heart just about everywhere. It’s on a utility box or sign or someplace every other block. There are a bunch around the 8 freeway ramp. There are a lot of these painted on signs and utility boxes around the skate park. There is also one on the 2nd Chance Sports sign on top of the building next to the peace sign – on West Point Loma Blvd and Sunset Cliffs. They’re popping up in more and more places! What the heck is going on? The discussion is getting a little intense on the OB Crime watch facebook page about this. Meanwhile, one was painted on a corner of OB Elementary School. Someone tagged up Tower 5 on the beach in the last day or two as well. Lots more graffiti popping up all over town the last couple months. Likely an attempt at “renegade” art, or to gain press for some promotion. Regardless, it’s not cute. it’s tagging and illegal. The perpetrator should be arrested, fined and made to clean them and other graffiti in town. The OB Rag has done a disservice to this community by promoting this vandalism. Bad form. If you think this is tagging, well, I can’t sugarcoat it, you have no idea what you are talking about. It just sounds like whatever it is, these penguins and whatnot, you don’t like and want them gone. I agree they shouldn’t be there if they aren’t supposed to be there, but please educate yourself on what tagging is because it sounds like you obviously don’t have a clue. Could it be “Renegade Art”? Maybe. Graffiti? Possibly. Vandalism? Definitely if you get technical. But it is not “tagging”. Do you think it’s tagging because it was painted with spray paint? What if it was painted with acrylic paint and with a paintbrush? Wouldn’t it just be a painting then? My whole point is, if you’re going to call out the Rag for having bad form, at least know what you’re talking about. if people are bitchin’ about this crap, it just means the SDPD hasn’t shot any body in OB lately! So it’s be cool to spray paint your house or car then? How to classify this (graffiti, art, etc) is interpretive. It isn’t ugly. The problem is that the OB Main Street Association, the Peninsula Community Planning Board, Point Loma Association, taxpayers, business owners, property owners, and our community etc., are left with the cost of fixing this. It is very costly and time consuming to paint buildings and signs. It is costly to repair or replace paint and signs. Maybe the artist needs to look into avenues of expression that don’t cost the rest of us to repair. Maybe stencil onto a canvas, or paper? If I was lucky enough to get a penguin on my wall, I would figure a way to add a personal touch. Go Mr. Potter! I am not sure I condone it, but there is something to the revolutionary spirit in which that kind of public art is presented. Some of the message is its location. If the penguins were not well done, it might be another issue. I may well be a jerk—I do smile when I see a penguin pop up here and there. Whether or not it’s cute/non-offensive is a moot point. If the building it went on belongs to someone who did not want it there, then the tagger is a jerk. End of discussion. I file it with picking up the dog poop. Graffiti vandalism is the last thing Ocean Beach needs if it is to attract investment money for the town’s long awaited and much needed redevelopment of it’s oceanfront and business district. It”s not tagging. Unless some gang-bangers are now using penguins, which is hard to believe. I wish it was Banksy!